The global political elite opposes Brexit. Nick Robinson made the point this morning on the Today programme, as he taunted Nigel Farage and triumphantly challenged him to name a single international organisation that supports Brexit. A procession of people in powerful positions and bursting with prestige have been asked by their fellow elite in the UK to speak up in favour of Britain remaining in the EU, and they have duly obliged. The media has lapped it up and without giving a moment’s thought about why this is happening, or asking what’s in it for the political class, they’ve just presented it as a reason to Remain. 'Don’t question anything, just do what our betters say. And definitely don’t ask about any vested interests or why they are so curiously keen to look out for what’s supposedly in the best interests of the British people'. The political elite has descended on Britain to advance a raft of claims and assertions that just do not stand up under any reasonable scrutiny of the facts, not that the media tries to examine them in any detail. They do it because they are servicing an agenda that is bigger than Britain leaving the EU. The political elite want the world sliced into regional chunks where voters are unable to effect change and powerless to alter course. But from the official leave campaign we hear nothing of this. This is part of a war on democracy. It's not an exaggeration. Democracy has been reduced to trapsing to the ballot box every four to five years and voting for party political drones who invariably all deliver the same outcome. The political elite are working to ensure they and their chosen successors have permanent, unaccountable control that gives them the ability to set the direction countries will follow. They are working to an agenda to secure for themselves a huge amount of power and the ability to deliver profitable outcomes for themselves and friends. This is why Brexit isn’t about trade. It isn’t about security. It isn’t about the economy. It's about democracy – people power - people being able to control the politicians and not being subordinate to them. It’s about the British people deciding Britain’s direction, rather than a group of people who want us to simply be quiet and pay the bill. If you want to have a say in Britain's future direction, to have the ability to control our elected representatives, rather than be controlled by them and their unelected friends who make our policies and laws without our consent, then you must Vote to Leave the EU. You could be forgiven for thinking that in the height of a referendum campaign I should be pumping out blogposts challenging the Remain side with facts and evidence to rebut their increasingly ludicrous claims. But I’ve found it incredibly difficult to motivate myself to so much beyond the occasional tweet as the campaign stutters to a self-inflicted defeat. The writing was on the wall when Vote Leave won the designation to be the official leave campaign. It signalled a descent into inane soundbites, personality focus, idiotic stunts, confused messaging and unnecessary friction with the media. Vote Leave do not speak for me. Hell, they don’t even genuinely believe in the Brexit cause. I fully expected them to trip over themselves and tie themselves in knots because they are led by a man who is only in it for the money and the profile. But even I didn’t expect them to style themselves as a retro Ukip outfit, latching on to the arguments and ill-thought out pseudo-solutions Ukip previously advocated but then abandoned several years ago, pushing false claims and doggedly refusing to promote any exit plan. I certainly didn’t expect them to adopt an EU-enthusiast as their figurehead, who would needlessly plumb the depths by resorting to identity politics in a cack-handed and counterproductive attack on the US President, when his arguments could have been more forcefully torn apart with the simple deployment of facts. At least a small dose of reality hit Farage and Co and they accepted the legal necessity of using Article 50 and many on its party board even came around to seeing the wisdom of withdrawing from the EU to the EEA as an interim step that would enable Britain to neutralise any possible negative consequences for the economy and jobs, thus removing the Remain side’s biggest stick with which to bash the Leave side during a campaign. But no so with Vote Leave. Those baby steps of progress in the Eurosceptic camp have been swept away in a tide of self-regarding arrogance and stupidity that leaves Remain in a strong position to win the referendum. The official campaign has been hijacked by a bunch of Tory tribalists and special advisers who kid themselves they are unrecognised genius, but who are slowly killing any chance of winning the referendum. Why on earth would I want to be tarred with the same brush as them? I’m not saying things would be any better with Leave.EU/GrassrootsOut. But as shambolic as they were, they at least genuinely wanted Brexit. No doubt the media, which bought and cultivated the narrative that Matthew Elliott and Dominic Cummings were experienced and brilliant campaigners for falling over the finish line in two unlosable campaigns (NE Regional referendum and No to AV), now see these lightweights for the overrated fools they are. Their only talent is schmoozing people and worming into positions by currying favour. They only put a dog in the referendum fight when they cynically calculated there was something in it for them. Their lamentable performance finally exposes them for what they are. The losers in all this are those of us who for years have held, as a matter of principle, that Britain must leave the EU for democratic reasons, and in order to ensure British voters make British laws, enforced by courts in this country, and that we determine our country’s place and voice in the world. The political game playing and personality politics of the referendum campaign is snatching the goal away from us. When this is all done and dusted, there needs to be a reckoning. 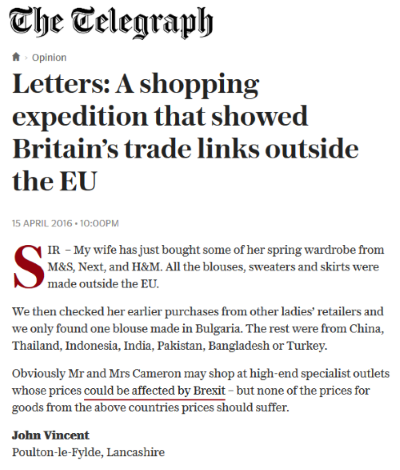 The letter above demonstrates the need to explain the difference between trade agreements and deals. Darling was completely wrong. He was being deliberately misleading, because deals to sell goods are not the same thing as trade agreements. Sales deals have to stick within the terms of whatever negotiated trade agreement or terms are in place. The EU, not Britain or any member state, negotiates the terms of trade agreements with non EU countries. Darling knows that and was evading acknowledgement of a massive trade limitation of EU membership. That said, Nick Robinson wasn't correct either. Britain does not negotiate agreements through the EU. Only the EU negotiates agreements, not its member states. Britain can only make sales deals, and these must abide with any terms the EU has agreed. This is a point too many people do not understand. The EU decides what import and export terms, quotas and tariffs member states must accept and apply. Britain is not in control of its trade. The EU common negotiating position often waters down and sometimes excludes things that member states want the trade agreement to include, which is detrimental to those member states.This means trade agreements can be negotiated which may, for example, see British requests for the agreement to make it easier and cheaper to sell some of our manufactured goods ignored, because the EU sets the aside in order to meet the wishes of other member states who are pushing for the agreement to include favourable terms for, say, agriculture that the third country won't accept if manufacturing is also included. If Britain wanted to guarantee its manufacturing goods were part of a trade agreement with another country, it could only do so by negotiating trade agreements on a bilateral basis - and that can only happen if Britain is not a member of the EU. Similarly, if Britain felt it would benefit its citizens to import items without any tariff in order to make them cheaper, it could only make such an agreement if it wasn't a member of the EU. Britain's trade links outside the EU are still governed by the EU. So if the EU cannot agree terms with a third country, Britain can't go off an make its own bilateral agreement with that country. In the same way, if the EU cannot or will not agree better terms for an existing agreement, Britain may be stuck with tariffs and non tariff barriers to imports and exports that we may be able to get rid of as an independent country. The Remain side argues that under EU trade agreements Germany sells far more than we do, as if it were evidence that the EU's trade agreements are effective and beneficial. But just because an agreement's terms make it possible for Germany to sell lots of automotive products, it doesn't follow that the agreement includes terms that make it possible to Britain to sell the same countries huge volumes of technology, or pharmaceuticals. 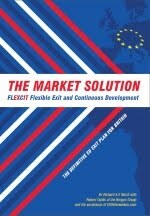 EU membership denies us flexibility and agility in the globalised world. It is a powerful reason for us to leave the EU. Back in February I wrote a piece titled, 'The five strikes against Cameron that see the referendum fail the legitimacy test' which I have reproduced below. It is particularly apt today as Cameron has, with typical arrogance, now launched a taxpayer funded (without permission or consultation with taxpayers, of course) £9 million government propaganda website, accompanied by a 14-page pamphlet being delivered to every household in the UK. 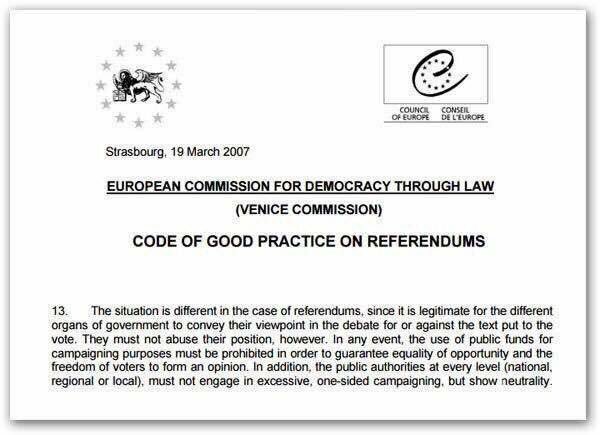 This is yet another assault by Cameron on the Code of Good Practice on Referendums published by the Council of Europe (not an EU body), and at the Neill Committee on Standards in Public Life. See below for details. Cameron's referendum already failed the reasonable legitimacy test. But today's actions compound the appalling contempt he has shown for the public, for fairness, for integrity and for adherence to internationally-developed standards for the neutral and impartial conduct of referendums. It is a disgrace. 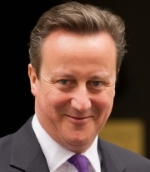 David Cameron's actions are an abuse of power, an affront to democracy, and would shame a tinpot dictatorship. So said David Cameron's spokeswoman to the media last September when the Electoral Commission recommended the referendum's question and answers be altered to removed a perceived bias to the pro-EU side. The government's approach seems to have changed more recently, by ignoring the Electoral Commission's advice on the timetable for the referendum. 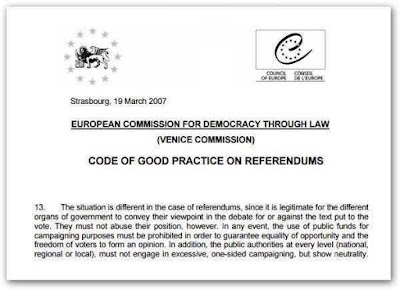 Now is an ideal moment to revisit various recommendations on the timeline and conduct of referendums - brought to light by the formidable research of The Leave Alliance - to expose how Cameron not only lying about his non binding and entirely reversible 'dodgy deal' with the EU, but is also fighting dirty in an effort to win 'his' referendum at any cost, and keep Britain subordinate to the EU. Once the date Order has been approved, the legislation requires that there are a minimum of 10 weeks between the Order setting the date of the referendum and polling day itself. The Commission continues to recommend that best practice for referendums is that all legislation (including the introduction of regulations to Parliament for approval) should be clear at least six months before it is required to be implemented or complied with, although this is not a legal requirement. Cameron has chosen to ignore this so he can rush to a vote in less than four months. Rather than separate the designation of campaigns from the referendum period, it looks certain that such activity will take place during the referendum period, shortening the time that will be spent on actual campaigning, to give the Remain side an advantage. Something else the government has chosen to ignore are the findings of both the independent Commission on the Conduct of Referendums, a joint endeavour of The Constitution Unit and the Electoral Reform Society, and the the Neill Committee on Standards in Public Life concerning the conduct of referendums. The commission said that the responsibility for the publication and management of information relevant to a referendum should be exercised outside of Government - by an independent commission. It also recommended that the conventions which require the Civil Service to avoid engaging in political or public debate and which limited its actions to the provision of factual information, should be maintained. We believe it is perfectly appropriate for the government of the day to state its views and for members of the Government to campaign vigorously during referendum campaigns, just as they do during general election campaigns. But we also believe that, just as in general election campaigns, neither taxpayers’ money nor the permanent government machine – civil servants, official cars, the Government Information Service, and so forth – should be used to promote the interests of the Government side of the argument. In other words, referendum campaigns should be treated for these purposes in every way as though they were general election campaigns. The government of the day in future referendums should, as a government, remain neutral and should not distribute at public expense literature, even purportedly 'factual' literature, setting out or otherwise promoting its case. Cameron, by ignoring the Electoral Commission, an independent commission and the findings of Neill Committee, has shown he is determined to use the full machinery of government to fight a heavily slanted campaign to remain in the EU. His co-opting of the civil service to actively help that side of the referendum argument, and his instruction to deny ministers who want Brexit, access to any official documentation relating to EU matters while making it available to the pro-EU ministers, shows how dishonest and dishonourable he is. "One purpose of a referendum is to secure legitimacy for decisions where Parliament alone can not secure that legitimacy. For that legitimacy to be secured, the losers have to feel that the fight was fairly conducted"
Code of Good Practice on Referendums by ignoring its statement that must be a neutral attitude by administrative authorities, and that equality of opportunity must be guaranteed for the supporters and opponents of the proposal being voted on - which he has breached by denying pro-Leave ministers access to official documents relating to the EU. With those fives strikes against Cameron, his referendum already fails any reasonable legitimacy test, and we haven't even had the vote yet. Expect more of the same in the coming weeks and months. Because of this nothing will be considered settled. No matter what happens, the fight for Britain to be a democratic nation will continue after 23rd June.